I’ve been thinking I just need to get on and do a little update. At the moment I’m feeling so very motivated, as I’m feeling great – I’ve just had six hours uninterrupted sleep!!! Hooray! The triplets were very difficult to get to sleep last night, a fitting conclusion to the day which was also full on. However, they were all bathed, fed and asleep by 7:00pm and what do you know – they slept through until 5:00am! And again I say Hooray! The triplets are now 4 months old. They are completely delightful, flashing big smiles liberally and starting to be quite the chatterboxes, gooing and gurgling away, kicking their little legs furiously to express the wild excitement to be living such a grand life. Their colic and reflux is settling down, although it is far from over. We are now at the stage where they are constantly throwing up. We go through myriads of bibs during the day and several changes of clothes. However, they do not seem to be crying as much, a nice indication that it is not painful. They are still feeding around the three hour mark as a general rule. Sometimes more, (and on days like the last few), sometimes less. For the last two days they seem to be drinking continuously. However, since they have slept through the night, they are fully forgiven! OK. So, proof that life is crazy busy at the moment. I started writing this post over a week ago. I’ve got 20 minutes in the house by myself now, (J Boy at school, T-Star is hanging out with Grandma and no helper for a little bit) so thought I’d try to finish it. Already, I can hear some movements indicating that one of the three sleeping triplets is waking. OK, heard a dummy drop on the floor. 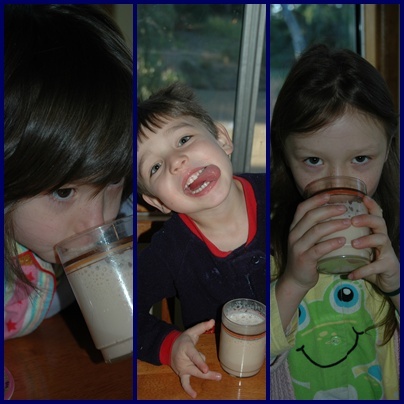 Life with triplets… Time is up. J Boy is continuing to enjoy school. He is super tired by the end of the week, and consequently his behaviour at home can get quite feral. I’m sure this will get better as his stamina improves and he gets more used to school. T-Star is getting used to being ‘the man of the house’ once Daddy and Jonty leave for school. He is still a very doting big brother, and can be very helpful. The other day I had three screaming babies and only two adults. I ended up sitting next to T-Star as he nursed a baby and fed him a bottle. Turns out it was activity enjoyed by baby and toddler alike! He’s a very sweet and loving child. Until he starts chucking major two year old tantrums. Eeeek. Never fun, and I tell you, T-Star can chuck a doozy! T-Star continues to be mad about motorbikes. Here he is after hearing Daddy arrive home after his bath. He charged outside and was super thrilled to get a ride on the driveway decked in nothing but a towel! It is now the third week since I started this particular post. Last week I had a moment in time, but blogger was playing up and I wasn’t able to post, so I had some script saved in Word. It’s truly reflective of life at the moment. Busy, busy, busy. The triplets are now 5 months old, and despite my original joyous declaration, their sleep seems to be getting worse rather than better. For the last several nights I have been interrupted hourly most of the time. Hence I’m rather exhausted at the moment. I had my first episode of pure exhausted desperation yesterday morning when I just couldn’t settle Joey down in the early hours of the morning. I ended up howling. The Accountant came to the rescue and shipped Joey off to another room. But he had to swap Joey for Chook, so it was still another hour before I got to sleep, but at least Chook was content to feed, whereas Joey was just wriggling and crying, inconsolable. I think I’ll sign off for now, before the interruptions continue and I never get this posted. Has your life been full of interruptions also? Who or what normally interrupts your schedule? 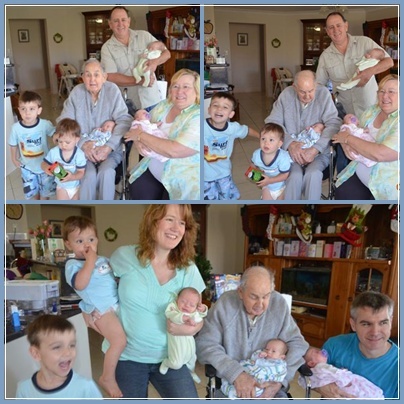 It was a beautiful moment when he first met three babies, his great grandchildren, at once. He was thrilled. The first baby to meet him was Missy. Great Grandad said nothing when I held you towards him to say hello. He just leaned in and touched his forehead to your forehead. In a few short seconds he was smitten with you. He continued to adore you as he held you. Then he met you, Chook. Great Grandad thought you were wonderful. And Great Grandad’s heart melted just a little more when he saw you, Joey. We had some family photos. And then your big brother amazed Grandad by showing him his favourite computer game. Back when Grandad was a boy, he played very different games. ﻿We will tell you all about those ‘olden days’ one day when you triplets are old enough to understand. But for now, you have enjoyed cuddles with your great grandfather who already loves you very much. Never underestimate how great the power of having generations of love being poured into your life. And never forget that you are loved because you are you. You are three individuals born into a loving family. Let me introduce you to my family. It’s hard to fathom that we are now a family of seven plus one canine (and a few guppies). déjà vu. There was once upon a time when each morning and evening we would travel into work together and when we got home, there was no one in our little home apart from us. I remembered all the trips to and from town when I thought lifetime of infertility was a very real possibility. I remember countless discussions, tears, obsessing, prayers and wondering whether we would ever have children. And here we are. Jeremiah 29:11, a scripture that has long been stored in my heart is so true. I never would have imagined in those days that we would have not only just one – but five children! And that three would be triplets, no less! I am a blessed mother indeed. He settles the barren woman in her home as a happy mother of children. Praise the LORD. Alex is my first and only love. We were married in January 1998, and what a life we have lived together! We have grown up together, travelled, laughed, cried, fought, talked (and talked, and talked), become parents, and fallen more deeply in love with each other (after the fights, not during) as each year of our marriage progresses. Methodical and precise, with a touch of caution – like any good accountant should be, Alex also has a quirky and engaging sense of humour. He loves being around people and socialising. Alex is a sensational father. His patience with our children is as unending for them as his unconditional love. I love him with all my heart. In chronological order – our next ‘family member’. ﻿In the spirit of every purebred Labrador, Bronco is a super friendly dog and the best of family pets. He doesn’t mind at all when children roll all over him, pat him profusely, drag him around the yard or even take food from his mouth. (Well, he does mind that, but he’s too well mannered to do anything about it.) He will do anything for food, and he will eat just about anything offered to him. He’s even so obliging to try and chomp on the clods of dirt and sticks the boys feed him. My firstborn entered our family in July 2006. J Boy is an energetic boy loving life and enjoying playing and spending time with family, especially his cousins. J Boy loves construction – from earth moving equipment to constructing with toys such as Lego and blocks. Even though he loves being around people, J Boy enjoys his own time and will be satisfied for hours playing on his own. He has a very strong personality which isn’t always easy to parent. However this strength of character will become one of his greatest assets one day, because as his will is lovingly molded and he grows, his determination and persistence to stand firm in his beliefs will help him in so many areas of his life. Another bundle of energy, T-star will melt any heart because he so, so, so cute! Born in November 2009, this little guy is so loving and nothing beats his excitement when he greets people he knows and loves, running up with great excitement making all types of excited exclamations! The T-star is our outdoor boy. Nothing warms his little heart more than traipsing around the backyard exploring. He is also very I.T. savvy. He watches carefully and learns how to operate DVD, CD’s, microwaves, phones, etc. He also employs this method of learning to get into child locks over the house. With his inquisitive nature, this knowledge and access to all areas is of great satisfaction to him. This little Aussie baby is happy to snuggle up secure in his loving arms, just like a joey kangaroo snuggles in it’s mother’s pouch. Illustrating size is no barrier, Joey was smallest, but first triplet to make an appearance in this world. Born at 1:23pm. little Joey weighed in at 4lb 2oz/1895g. He was 43.5cm long with a head circumference of 31.5cm. Joey is a contented baby, although he can certainly let his opinion be known if he feels strongly enough about something! “Chook”, (An Australian word for chicken), was our ‘big’ baby. Weighing in at 4lb 13oz/2205g after he hatched. Despite his impressive size, he did need assistance with oxygen for the first day, whereas the other two did not. Before long he was at the same development as the other two. Also born at 1:23pm, Chook was 46cm long with a head circumference of 32.5cm. He appears to be the most laid back of the triplets, fairly content to let the world just drift by. So long there is plenty of milk and cuddles, you can’t really ruffle Chook’s feathers. Our ‘youngest’ child, born at 1:25pm, 2 minutes after the boys, Missy is our only daughter, and the fairest of them all. She weighed in at 4lb 6oz/2160g. measured 43cm in length and had a head circumference of 31cm. We suspect our little girl is no shy retiring violet, she already has displayed quite a feisty little personality! She seems to rule the roost with the triplets, being the most vocal and also constantly jumps the breastfeeding queue, waking up before the boys regularly to get first dibs at the breast. You can already tell she is perfectly equipped to grow up in a male dominated household and will probably be classified as our ‘pink boy’. ** These are not the real names of my children. You know, in case you were wondering. I’d love to share their real names with you, but not everyone who is on the internet is as nice as you are I’m afraid. I started to write week 29 of my Triplet Pregnancy Journal, and then realised that I spent a page writing nothing about the pregnancy. I always write the journal in a word document for myself first. (Which is why if you look carefully in my first draft, I often have dropped gender/names that I forgot to adjust!) So, because the journal is a record for our family, I’ve decided to keep it there, but for this blog, I thought I’d still include it as a separate post, since it was a good tale to tell. This week began by waving the boys and their Daddy goodbye. 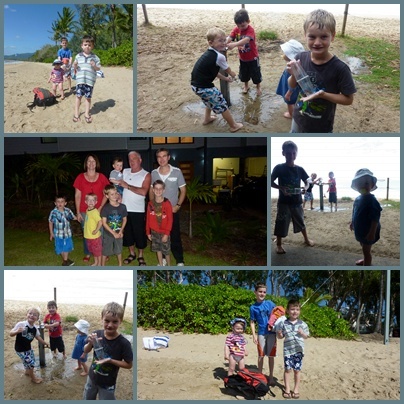 They all travelled up to the warmer climate of Cairns in North Queensland to celebrate his sister’s 40th birthday. It was a shame I wasn’t able to go also, but completely out of the question, for obvious reasons. Not to mention the plane probably wouldn’t have become airborne with the triplets and I on board. Yep, the kilos keep piling on! Mind you, keeping a plane grounded would be preferable to going into labour mid-flight. But then again, it would be one way to make the national news. After waving the boys goodbye, I received a phone call in a couple of hours time to say they had missed the flight. Since I wasn’t travelling with them, I had forgotten about our pre-flight routine. It’s the one where The Accountant predicts the time it will take to travel to the airport. Then I go and do my own prediction and disagree with him, saying it will take longer. We will then argue the merits of our suggested time frames for a couple of days until The Accountant will extend the travel time and concede to leave a little earlier, just to make me happy. (Or shut me up.) We will then often arrive early to the airport and The Accountant, who is very fond of sleeping in will lament the fact that he could have stayed in his cosy bed a bit longer. So this time I had left the timing entirely up to him. He left the house 10 minutes later than he planned. (To be expected. Especially when he had allowed 25 minutes from the moment the alarm went off to when he was supposed to walk out the door with two children.) I had packed a lunchbox for both the boys with some breakfast things like fruit, muesli bars and dry cereal for the trip down. Apparently right after Trent drank the juice he vomited. (Not expected) So Alex had to stop and clean that up. Then he got stuck in Brisbane traffic for another half an hour. (To be expected.) By the time he dropped the car at the car parking facility and arrived at the terminal he was 20 minutes late for check-in. Therefore he had to book a flight four hours later in the day. Soon afterwards I received another phone call. Trent had diarrhoea. Oh dear, the poor boy had caught my tummy bug. My unfortunate husband was trapped in an airport for four hours with a sick kid. I suggested there was a park nearby that might help waste some time and gave my commiserations to him for having to change the nappies. He went to the park, where Trent proceeded to fill a nappy which took my darling husband half an hour to change. It was sometime during the afternoon that I suddenly realised that in the communal cabin luggage I had packed ample nappies for a two hour flight, but not nearly enough for a two hour flight + four hour delay + diarrhoea. I also hadn’t packed a spare change of clothes. I felt awful. They just made it to Cairns but needed to crack open the suitcase as soon as they were able to retrieve it from luggage carousel. By all reports the trip was enjoyable for the three of them. Admittedly, Toddler T was at a disadvantage in the reporting back process, given his inability to construct sentences. Were he able to do, the report may not have been as glossy when he expressed his dissatisfaction with being left with a unknown babysitter for the first time all day and night on Saturday in an unfamiliar place. A did admit that he was crying quite a bit that afternoon. At least Daddy had returned during the afternoon for a cuddle was able to bath and tuck him into bed. And the next day at a family barbie on the beach, the T-ster stuck to his Dad like glue. 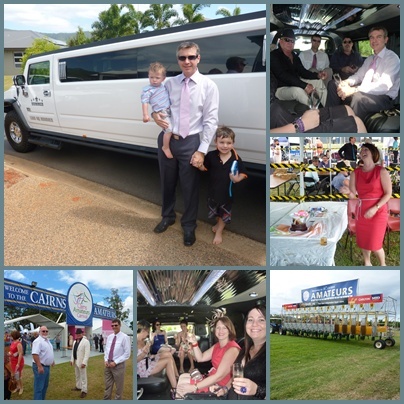 It did allow The Accountant to celebrate his sister’s 40th birthday at the Cairns Amateur Race Carnival during the day and have dinner with the family that night. I’m so disappointed that I wasn’t able to get dressed up for the race day! I don’t care so much about the horses, but it would have been cool to wear a hat, heels and a fancy frock. Their ride, a Stretch Hummer looked pretty cool as well! 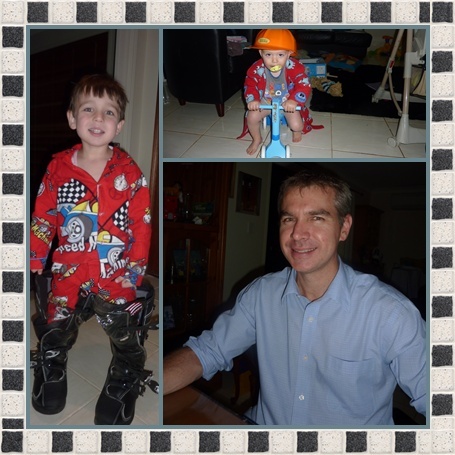 The Accountant has received compliments on his brilliant fathering skills looking after the two boys with absolute patience and attentiveness. This I don’t doubt for a moment. He really is a marvellous Daddy. It’s not all Dad’s that would be brave enough to take a 1 and 5 year old on a plane alone and be responsible for them for four days. The boys came home loving the time they spent with cousins, aunt, uncle and grandparents – not too mention the sunshine, beach and lots of playtime. My man and my boys are gone. They’ve been gone for four days. They ought to be home at midnight, I’m heading to bed now. Hopefully I hear them when they come in, even though the boys are sure to be asleep and their Daddy will gently carry them to their beds, it will be nice to kiss the foreheads of my sleeping cherubs. It was my sister-in-laws 40th birthday in Cairns. They’ve been celebrating with all the family up there. My bulging belly and I stayed at home. I’ve enjoyed it. I like the time by myself. Although, I must admit that for an hour or so each day I’ve caught up with friends and family. But I’ve also read a book, had lots of sleeps and spent Saturday in my PJ’s, until I had to get dressed for a nice dinner with my Dad and sister. It’s been lovely. But the single life is not my allotment in life, and I will welcome back all my boys with open arms! I can’t wait for cuddles in the morning! How long has it been since you’ve had the house to yourself? Do you, or don’t you like being at home alone? My 93 year old paternal grandfather and 79 year old maternal grandmother live in town. (She was young when she had Mum & Mum was young when she had me) Twice a week my mother visits them. My boys now go with her which gives me the opportunity to rest. Nana’s place is a big favourite. Having always been a grandparent who spoiled her grandkids, she hasn’t changed her tactics for the next generation. She has a big biscuit jar full of cream and chocolate biscuits and if Mummy isn’t looking the kids can pretty well stuff themselves with as many as they like. (Before Mummy starts looking again.) One day Nana had soft drink in her fridge. She was so delighted with J Boy’s excitement about consuming this special occassion liquid, that now whenever they visit there is always a can of soft drink in the fridge for him. Toddler T isn’t so enthusiastic about soft drink. He finds that bubbles in one’s beverage is rather alarming. Then Nana discovered that Toddler T has developed a complete obsession with juice. Of course she has not got the same concerns as me about the nutritional value of water over juice. Neither does she endure tantrums when water is presented instead of “duice”, mainly because now there is a nice line of children’s juices sitting in her fridge. Last week J Boy went for a drive with Grandad to do some work at on one of his properties. On the way back Grandad decided he no longer required J Boy’s services for the next job, so proceeded to meet Grandma at Nana’s to do a child exchange. (As in where no child is exchanged, but one is passed onto the next person.) When J Boy heard that they were heading to Nana’s he was naturally delighted and proceeded to describe why he liked going to Nana’s. Suddenly he asked Grandad, “What’s your favourite food, Grandad?” Grandad paused trying to gather his thoughts in what appeared to be an abrupt change in the conversation. The boys eating their favourite foods. Unfortunately J Boy has been working on a new camera smile. One of the delights of having a happy childhood is all the happy memories that you can recall when you sit together with siblings and cousins, even parents, grandparents, aunts and uncles. Since I’m a parent now, I’m always wondering what happy memories are being created that are going to endure until adulthood in the memories of my children, neices or nephews. Sometimes you see them occur right before your eyes. The estatic reactions of children, enraptured in the moment. Time seems to pause and nothing else exists except sheer delight and living in the moment. On our recent trip west to one of my parent’s outback properties, (I said way back here that I would talk more about this trip), I witnessed one of those moments as my children and some of their cousins interacted with my Dad. I know that at least some of the children will remember this moment, and they in turn will remind the others. The camera was handy, so I started snapping. Because the farm is located at least an hour and a half away from any store, you always need to make sure you bring adequate supplies with you. 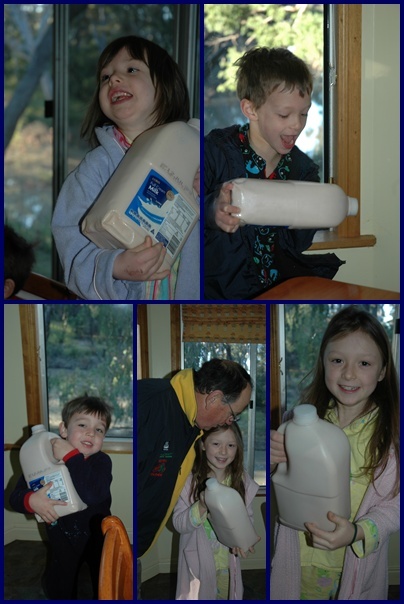 On this particular instance, we stocked up on milk, only to discover the fridge was already well stocked of milk. This led to milk being generously offered, which led to a Grandad invention. “Fluffy Milk”. Fluffy Milk is milo poured straight into a half filled milk bottle and then Grandad shakes the bottle vigorously. When he shakes it. It is absolutely hilarious. And of course it is delicious. It’s so yummy, you want to drink it again, straight away! And Grandad even lets you be a part of the shaking process in round 2! And it’s still just as fun the 2nd time. Cousin Pocket Rocket declared it to be “The Best Day of Her Life.” when further questioned, she even ranked it above Christmas. High praise indeed. This is the 2nd part of a speech my sister said at my baby shower. If you didn’t read Part One, it would make more sense if you read it first. The years passed and I fell pregnant with my second but still no joy of babies for my sister. I was so sure this baby would be another girl because my sister had always wanted a boy first and surely she would produce the first grandson/nephew. To my surprise our little boy was born and I beat my sister to producing the first grandson as well. Out of deference to my sister we did not use my Dad’s name, because we knew she wanted to use it as a 2nd name if she had a boy. I remember crying my own tears over this terrible road of infertility my sister was experiencing. Suddenly people started to think I was the older sister as I had the kids and she was still childless. It just didn’t seem like a victory having people think I was the oldest anymore. She had a boy – I had a girl – A cousin for my kids at last! Her little boy and my daughter are the best of friends (and foes) even now as two little 4 year olds going to kindy together. The years continued to pass and soon I was in hospital having my 4th child and on the very same day my sister was a few doors up in the hospital going through the IVF procedure in the hope to have a sibling for J Boy. 9 months later my second nephew arrived! To tease them back I taught my nephews to love driving with us in the tarago and I even taught them to say Tarago amongst their first words dad, mum, bub, twargo! We all seemed to settle in to life knowing that I would have the larger family full of kids and my sister would have the nice neat smaller family. After another round of IVF in hope for their final child – hopefully even a little girl and some disappointments along the way February this year my sister finally had success – she was pregnant again! The big surprise was that this time there was not one but two babies! How exciting twins! Another early scan brought the biggest surprise of all…. Not one, not two but 3 little babies inside. (2 identical and 1 fraternal!) My sister was having triplets. After all those years of teasing and vowing to never own a van, after all those years of me being the one with the most kids, after all those years of infertility and pain…. I can now say with a giggle and a grin…. How do you do it with 5 children – 5 years and under? I have one child for every age group…. After all those years of competing, teasing and bickering I can now most sincerely say…. You are a legend sister dear! I say it with a giggle and a good luck too…. My sister and my best friend. I had a baby shower recently. My sister did a really lovely speech during it that I thought I would share. Here is part one. My sister with Toddler T when he was a wee one. Hi I’m Katrina Caitlin’s oldest sister!!!! Well at least I always thought I should have been the oldest sister. Let me tell you about my oldest sister Caitlin. She was always getting in the way, taking some of the attention. Bossing me around. Yes, admittedly she taught me lots of useful life skills. Picking all Dad’s carrots out of the vegie patch! And climbing the Cupboard that held the Christmas presents. The Christmas Present Cupboard wasn’t all she snooped in. She was always reading my diary and would even write a message back at me in my diary starting an argument – in my very own diary! Things didn’t always go to plan. I still remember the day that she was helping me escape from the cot and she tipped the whole thing over on top of us both. The last I remember was waking up to an ambulance officer standing over me and then I had to get my chin stitched up. Apparently she knocked herself out too! Mum wasn’t too impressed. Alas the years of fun and games began. We were the best of friends and the best of foes all at the same time. When it suited us we got on very well. But truth is it just didn’t suit us all the time! Dad used to say, you two need to learn to get on. Your sister will be the best friend you will ever have! I remember she used to get so jealous of me some days. Why does Katrina get to go to bed at the same time as me or why does Katrina get this or that too…. It was always easy to get a bite out of her on these days! The years seemed to fly by so quickly and soon we were teenagers. My sister used to hate me coming up to her in high-school and talking to her when she was with her friends. So much so I used to seek her out – after all aren’t we meant to be best friends for life? Well so Dad says anyway. She used to pretend she didn’t know me on the school bus and I used to annoy her by talking to all her friends! We attended youth group together and some days we got on really well and other days I used to annoy and embarrass her. We seemed to be always competing with each other. 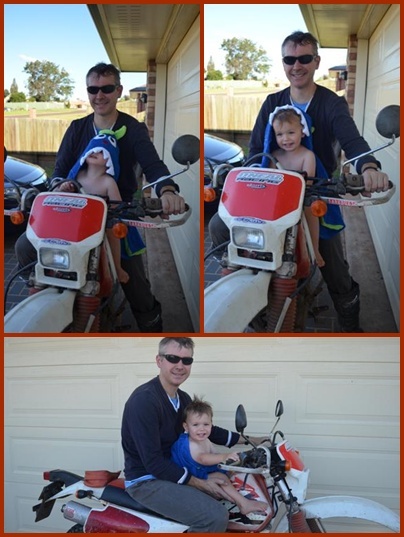 She learnt to ride her push bike – so I got Dad to take my training wheels off and took off. She finally got her driver’s licence after a delayed start, a couple of failed tests and being a very nervous driver. And so it happened that the government changed the law and the day I turned 16 ½. I went straight in and got my learners and licence 6 months later. Now we had to share the car! Boys – she got a boyfriend and suddenly a very nice young man begins to take me out as well! This is when Dad’s prophesy actually started to eventuate. We enjoyed a friendship once we were married. After a few years of married bliss my sister began to desire to start a family. Then suddenly out of the blue the shock announcement happens! I was expecting my first baby…. But it was now apparent the “Pain of infertility” was my sister and her husband allotment. That was followed by the pain of a miscarriage. My preganancy only inflicted more hurt on my sister and only emphasised the pain she was feeling. It didn’t help that she miscarried twice during my pregnancy with my first born. Suddenly all the years of competing and sibling rivalry were not important, suddenly I wished that my sister could experience the same joy as me. I think this is the one area that we were never competing yet somehow, strangely it seemed like I was the winner and she was the loser. At first my sister didn’t know how she could love my child but once my little girl Emily was born neither of us can imagine how she couldn’t love her little niece. The boys and I took a few days to go to my Mum and Dad’s farm out west this week. Mum and Dad have a house there, but don’t live there full time. Dad has been out doing some work, so we thought we’d pop in for a visit. We travelled out with Mum and two of my neices and my nephew. It’s so good to watch the kids experience life in the bush. Even though I’m not a farmer in my adult life. I will always cherish the memories of growing up on farms. I mainly took photos on Dad’s camera, so I might show some more when he returns to town. In the meantime, I thought I’d share these lovely moments. The kids warming themselves by Grandad’s fire.